Since I have been trying to avoid grains and beans the last few months I have been struggling with my food choices. I don’t know why eating had to become such a difficult prospect. Since I’ve been avoiding processed foods as much as possible I’m viewing the Supermarket with new eyes. There are so many hidden sugars, fat and chemicals in most shelf stable food that it’s no surprise that we are getting fatter and fatter. Reading labels has made me realize that many foods marketed as healthy are just junk food in disguise. I consider myself a fairly informed person and I find that navigating a supermarket these days is just dismal. I try to stay away from the inner aisles at the store and focus on lots of vegetables and small servings of organic and grass fed meats. It’s difficult to find snack foods that aren’t loaded with sugar, most granola bars and yogurts have as much sugar as a can of soda so I try to do my best to cook as much of our food from scratch as possible. One thing I pick up in the store a lot are those individually packed seaweed snacks but they are so easy to make yourself and actually taste better than most of the packaged varieties. I wanted to make a more substantial dish with them so I whipped up a batch of my favorite poke to put on top. 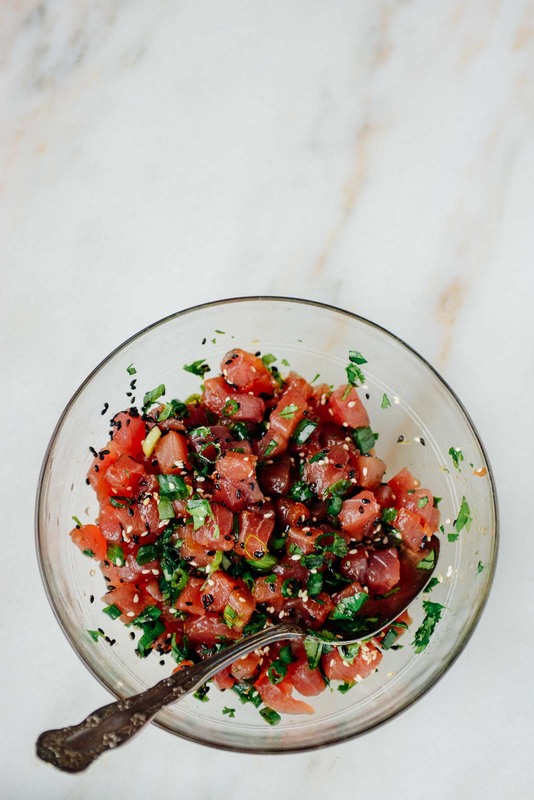 Poke is a traditional Hawaiian dish that usually is made with marinated raw tuna. 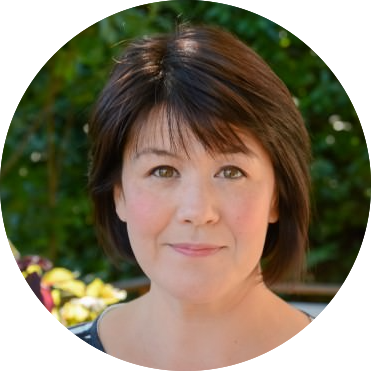 There are tons of variations out there but it’s super easy to make yourself. 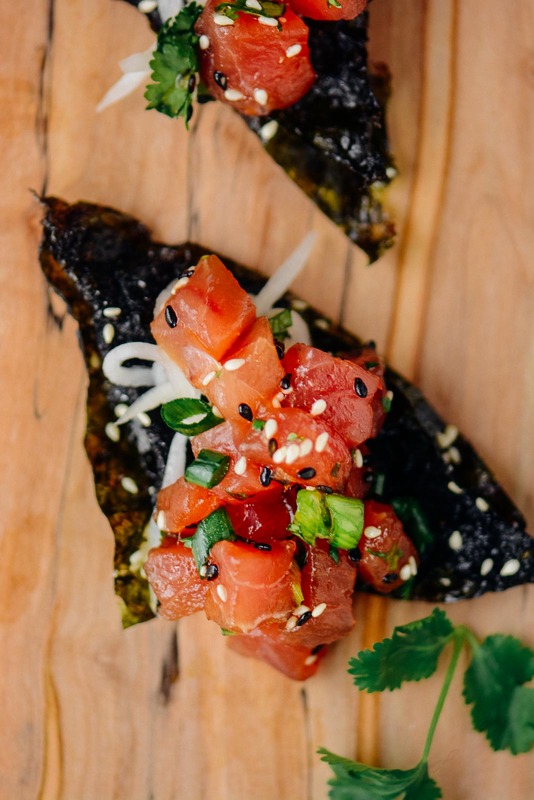 Make sure that you use sashimi grade tuna for this dish. Since I’m not eating rice at the moment I whipped up a super simple daikon radish salad to go with it and some crispy nori chips. You can serve it on chips or make it into a bowl for an easy lunch. If you are going to serve the poke on the chips plate it right before serving. The chips will get soggy if they sit too long. The poke will keep for about a day but it’s best eaten the day it is made. 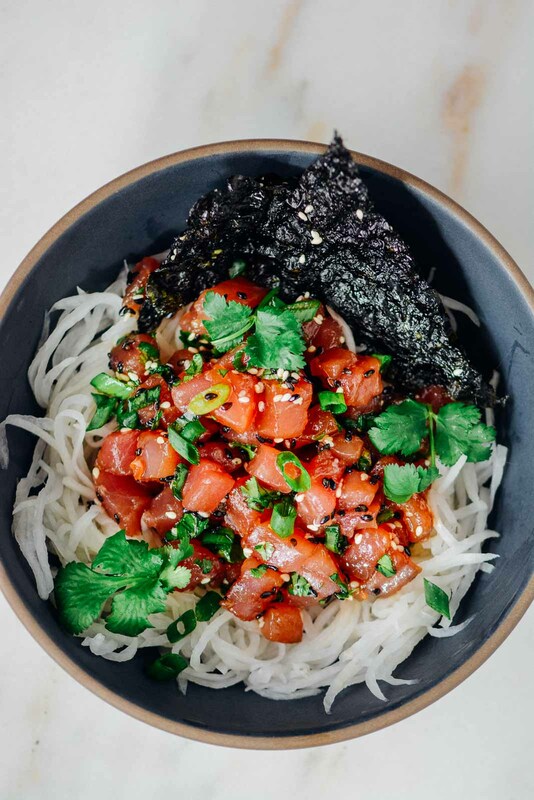 This poke can be served on top of some homemade nori chips or you can make a bowl out of the poke and daikon salad. It's quick, was and delicious to put together! Pre-heat the oven to 250 degrees and line a baking sheet with parchment paper. 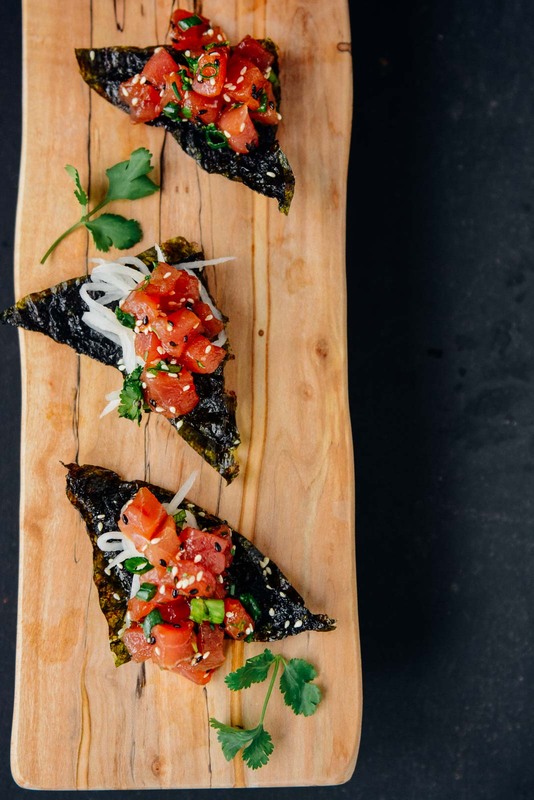 Lightly sprinkle one sheet of nori with a bit of water and top with a second sheet and press down firmly to get them to stick together. Brush the top with the sesame oil, sprinkle with half of the sesame seeds and a tiny bit of salt. Cut the sheets into quarters and then cut diagonally into triangles. 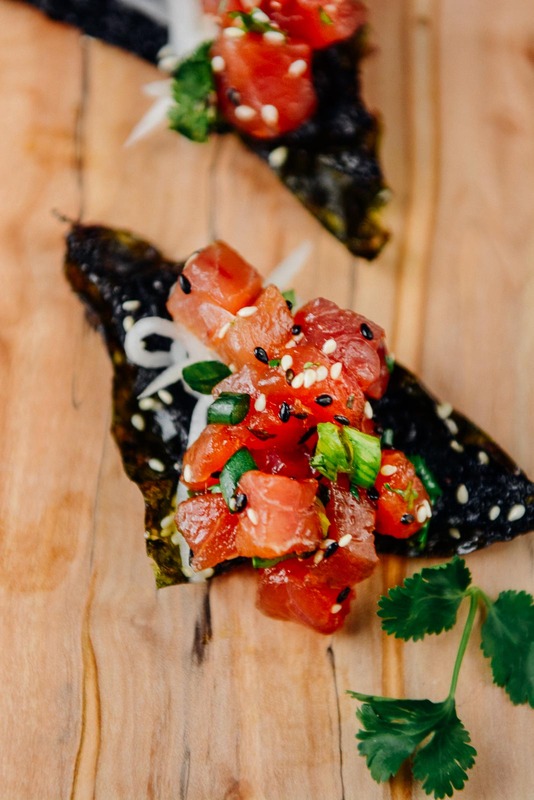 Place the nori on the baking sheets and roast 12-15 minutes until the chips are crispy and dry. 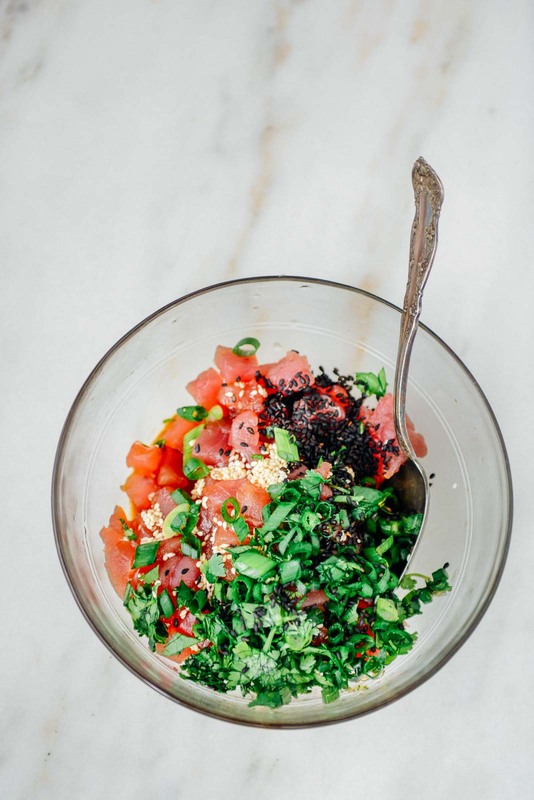 In a medium bowl place the soy sauce, rice vinegar, sugar, sriracha, scallions, cilantro and sesame seeds and stir well to combine. Using a mandoline or julienne peeler cut the daikon into thin matchsticks. In a small bowl toss the daikon with the rice vinegar, sugar and salt. Let sit for 10 minutes to let most of the liquid release. Before serving, squeeze as much of the moisture as possible with your hands. 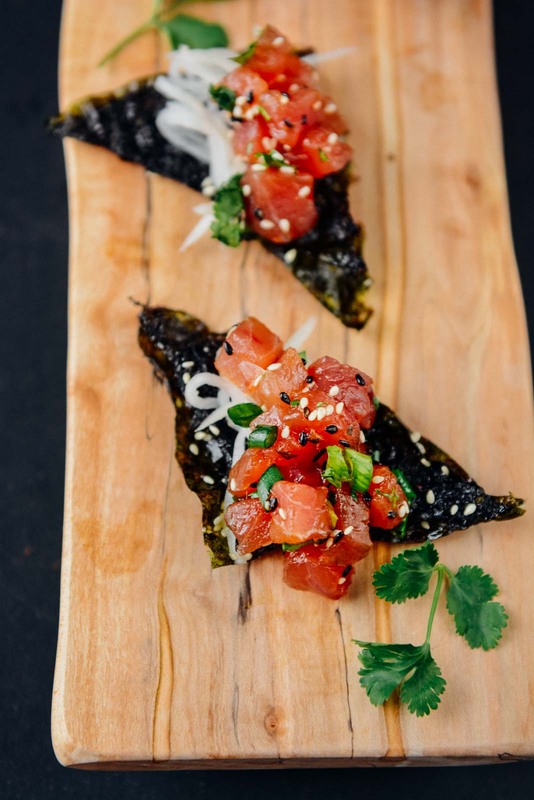 Top the nori chips with a spoonful of the pickled daikon and a spoon of the poke. Alternatively you can player the daikon into a bowl, top with the poke and serve with the chips on the side.